Happy October, friends! This month is always so fun, and it’s also my birthday on the 13th! I will be turning 28, and that actually feels just about right! 🙂 Lana ended up having a lot of fun at the orchard on Friday, and I always try to soak up those moments as much as possible! Also, many of you have asked for some tips for a new blogger on Instagram, so I am going to share 5 things that have helped me over the past couple of years! There is SO much information out there, so tonight I will just mention some really important things off the top of my head! Having a monthly budget is very important, especially when you are just starting out. Before you can create content, you need to have the product(s) for that content! I still have a monthly budget that I use consistently, and it helps me fill in the gaps throughout the month for posts. You can also collaborate with certain brands and boutiques on Instagram and exchange product for a post(s). This will help you create more content, but you never want to completely depend on that for your posts. You should always feel like you can be very picky about who you work with. You only want to share brands that you truly love and/or are really interested in trying. That way you remain a great, honest resource for your following. This is why I believe it is so important to have your own monthly blogger budget. You want to always be able to stand on your own two feet when it comes to posting. Before you can start getting compensated for your work, you need to be able to give examples of what you can do. You want to make your Instagram feed a place where brands can see the style and quality of your work. They should also be able to view collaborations you have done with other great brands. You can also start adding collaborations to your “Media Kit”, which is another name for your blogger resume. Many brands will ask for this when you want to collaborate. A media kit is just like any other job resume that shows what work you have done. Simply personalize it to show who you are/what you are about and add all of your best, past collaborations. You can find many examples of a media kit on Pinterest. 🙂 You can start getting your first collaborations by reaching out to small boutiques/brands that will normally exchange product for a post(s) like I mentioned earlier. Something I really love about this industry is how supportive most of the women are who are in it! I have met some of the sweetest, most genuine women ever through Instagram, and I think that is so amazing. 🙂 Many women I have gotten to know are women who became Stay-at-Home Moms and want to continue staying at home with their babies while doing something they’re passionate about or women who are trying to quit their desk jobs and do something they love. There are so many different situations, but I have learned that we are all so much more alike than we realize. We are obviously in a world now where social media is HUGE, so you might as well make the most of it and connect and relate to other real people. Engaging with others in your niche is also so crucial when it comes to growing as a new blogger on social media. The more you connect with others similar to you, the more you will come across people who they are connected with as well. Instagram’s algorithm is ALL about engagement. So it will definitely hurt you if you aren’t liking and commenting on other peoples’ posts that you enjoy and relate to. Instagram also wants to see that people are interested in your content. It will greatly benefit you if you start creating meaningful conversation and relationships with others. I LOVE my metaphors, so I will just say that I like to think of it as planting seeds throughout social media. 🙂 The more you connect with others and plant those seeds, the more you will grow! If you liked “5 Tips for a New Blogger on Instagram”, you can read my other similar post about “5 Ways to Get Noticed by Brands on Instagram” here. 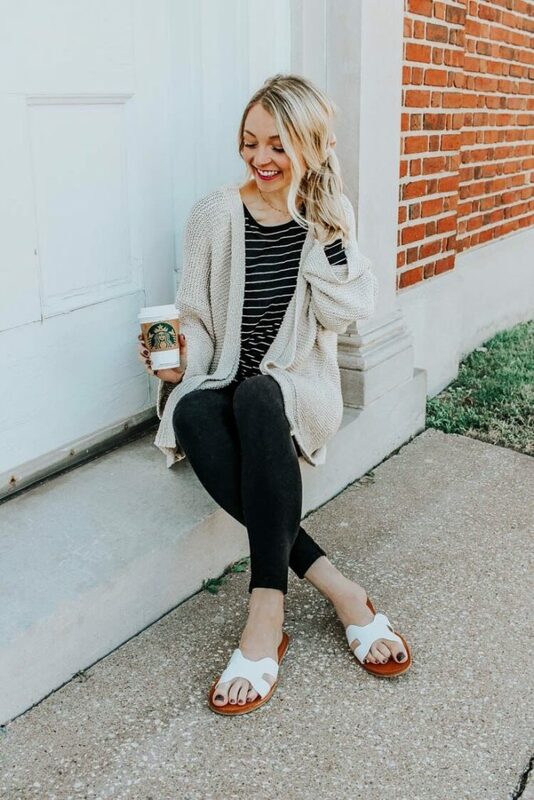 This entry was posted in Fashion, Lifestyle and tagged blogger, blogger tips, blogging, blogging tips, cardigans, fall outfit, Fall style, how to grow as a blogger, how to grow on Instagram, influencer tips, Instagram tips, slide sandals, slides, striped top, style blogger, tips for bloggers, tips for new bloggers.